Long,long time ago when heatwaves were able to occure without 61% of data adjustment. Thanks god nowadays we have extremly advanced supercomputers and experts who can make them happen whenever they want and need them. The definition of a heatwave in Aust has changed – again. Make sense of this definition by the BoM. ‘Heatwaves are calculated using the forecast maximum and minimum temperatures over the next three days, comparing this to actual temperatures over the previous thirty days, and then comparing these same three days to the ‘normal’ temperatures expected for that particular location. Using this calculation takes into account people’s ability to adapt to the heat. For example, the same high temperature will be felt differently by residents in Perth compared to those in Hobart, who are not used to the higher range of temperatures experienced in Perth. 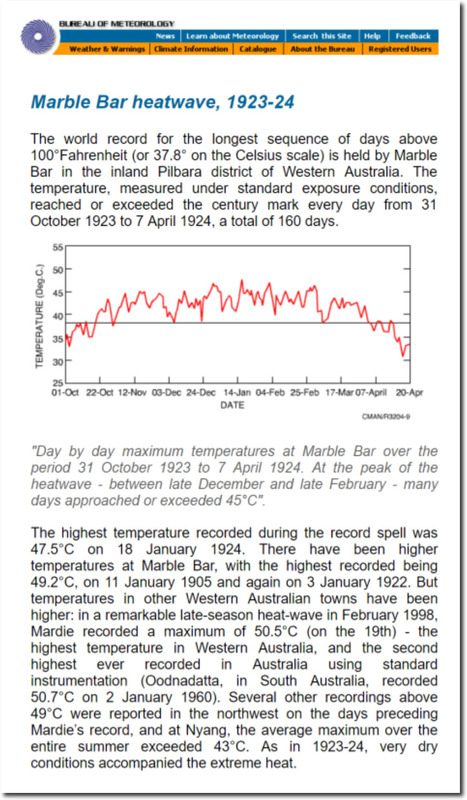 So we could have a heatwave in the Antarctic – but not in Marble Bar. This winter appears to be no different than the winters of 4 decades ago when the climate change worry was the beginning of a new ice age. And yet the leftists say it must be due to warming. I’m sorry, when Hawaii is having its most impressive snowfalls ever, that is not warming. We are waiting for Griff to straighten out Tony on this warm spell. He just did that on WUWT re fires in Tasmania. Of course more brilliant readers found his lies.